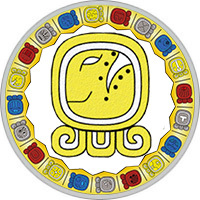 Mayan Name: EE / Eb. Compatibility: Road, Vulture, Sun, Lizard, Star. Mayan Sign Road (Eb) - unity, order. The meaning is the skull, the patron saint is the divine twin brothers Hun-Akhpu. Ancient myths contain a detailed description of the picture of the creation of the world, where a staircase is mentioned. According to the Mayan idea, the staircase is the pyramid of Heaven and Earth. The sign of Eb symbolizes the Road of Life: a man climbs the stairs to the crown of creation. The second meaning is Grass or vital energy, without which it is impossible to move along the Road of Life. Eb is the most enigmatic sign that unites disparate symbols. In general, the Road sign represents the idea of ​​a general order. People of the Road sign are distinguished by their organization and organization. Close people can be calm: the representatives of this day will never get off the path that they set out. Demonstrate the wonders of logic: guided only by facts, try not to load your head with unnecessary information. At the same time, the person of the Road sign is able to experience deep emotions, is sensitive to the problems of surrounding people. He painfully perceives lies and betrayal, stands up for justice. In his head, there is a stable idea of ​​good and evil, and tries with all his might to defend his convictions. It can be too insistent and exacting, but it works out of good motives. The man of this day is a brave, just warrior, standing on guard of order. Organizational talent of people of the Road sign allows them to succeed in any field of activity. Usually they occupy leading posts, skillfully manage a team consisting of hundreds of people. Always assembled and calm boss keeps respectful of employees, tries not to express his displeasure and irritation. The secret of successful work is quite simple — clear planning, competent distribution of roles. Thanks to the mind and ingenuity, it shows itself well in the financial sphere. To the person of a Road sign on the shoulder is the organization of one’s own successful business, the partners can be assured of his honesty and decency. People of the Road sign too idealize life. Dreams paint relationships full of love and harmony. Unfortunately, they are often mistaken and disappointed. Resentment is not the best adviser. Being at the mercy of negative feelings, they make mistakes: short-term romances are initiated. Nature has endowed them with the strength to endure the blows of fate, so they quickly recover and again continue to search for their ideal. The man of this day is a wonderful family man, experiencing the joy of communicating with native people. A confident, unflappable man of the Road sign is a reliable support for a fragile, vulnerable woman. It is necessary to him only to fall in love, as restraint is instantly replaced by passionate passion. Maybe too keen on finding his one, so he has many novels behind him. The goal-oriented man builds ambitious plans, tries to take place in the profession. The results of his work — material prosperity, comfort of the home, they are generously shared with close people by them. The woman of the Road sign boldly treads along the sinuous path of life. He tries to behave noble and dignified, but sometimes gets frivolous acquaintances. Numerous amorous hobbies do not affect the quality of work, an intelligent, serious woman — careerist, focused on their business. But close people do not feel deprived of warmth and care, after a hard day’s work, she will certainly take interest in their mood and well-being. Representatives of this sign adore to conduct long conversations, sometimes too addicted to gathering gossip, but not for idle pleasure: they are trying to find out the truth.